Donald Trump asks Americans to feel safer as he returns from the Singapore summit with North Korean leader Kim Jong Un and hints towards a better relation between the two nations. 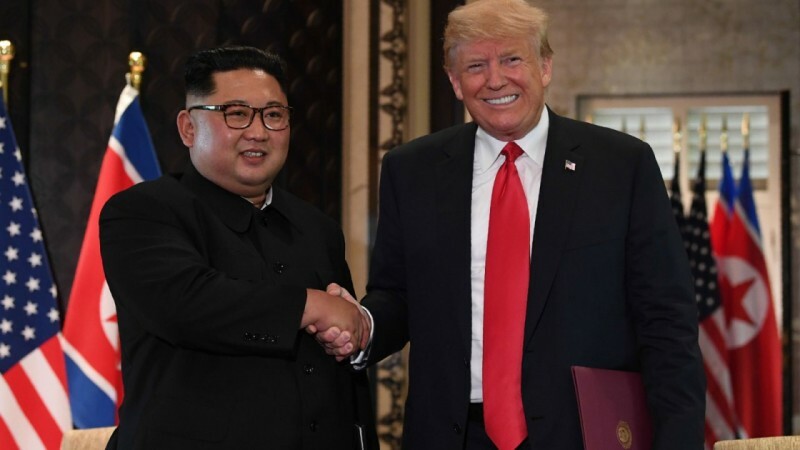 The return of American President Donald Trump from a successful Singapore summit with North Korean leader Kim Jong Un seems to have brought new cheer among the peaceniks. The US president has hinted at improved military relations with North Korea. Trump indicated at stopping the joint military exercises that the US has been conducting in collaboration with South Korea. He took to Twitter on Wednesday to convey the message to the world where he said: "We save a fortune by not doing war games, as long as we are negotiating in good faith." The president also said that the summit has been successful and it's time to be free from the nuclear threat from the other side. "Just landed - a long trip, but everybody can now feel much safer than the day I took office," Trump tweeted. "There is no longer a Nuclear Threat from North Korea. Meeting with Kim Jong Un was an interesting and very positive experience. North Korea has great potential for the future!" The American president did not forget to mention his predecessor in his post. He mentioned the name of former US President Barack Obama, who once said that North Korea was the biggest problem for the nation. Trump addressed his countrymen in the post and asked them to "feel much safer" now as he has joined office. Though the president tried to give some relief to Americans by hinting at no war possibility between the US and North Korea after the signing of the denuclearization agreement, the previously failed deals have a different story to tell. Experts have already claimed that North Korea still has enough fissile material for 20 to 60 bombs. Meanwhile, the defending call from Trump for putting a halt on the joint military exercises with South Korea against North Korea is troubling the former nation as well as Tokyo and Seoul, both of which have huge US military presence. Hence, the apprehensions continue to persist.